Suarez received a positive reception from Liverpool fans during a friendly at Anfield last weekend. WHAT A DIFFFERENCE 12 months makes in football. On this day exactly one year ago, it was confirmed that Luis Suarez had signed a new long-term contract with Liverpool. “I hope to play for many years here. This is a great team and everyone around the world knows Liverpool,” he said at the time. “When you are a kid, everybody wants to play for Liverpool. I am here now and it is a dream for me, and now I am a Liverpool fan. Of course, while there’s no reason to doubt that, at the time, Luis Suarez was genuinely thrilled to sign a new deal, last night’s report by The Guardian confirmed that there was at least one substantial caveat involved – if Liverpool failed to qualify for the Champions League, he would look to move elsewhere. Hence, assuming the above translation is accurate; at least some of what Suarez said back in 2012 was, quite frankly, gibberish. His reference to playing for Liverpool being a “dream” rings particularly hollow now, given that his current situation with the club is far more reminiscent of a nightmare. Moreover, the claim that he is a Liverpool fan seems similarly misleading; as such a phrase implies someone who is willing to stick with a club through thick and thin, irrespective of their league position. In reality, he is evidently desperate to depart from Anfield through whatever means necessary. He has decided, presumably in conjunction with his advisors, that going public about his desire to leave is imperative at this point – a move which will undoubtedly increase the pressure on Liverpool to sell him. And while Suarez was surely somewhat reluctant to speak so openly, he clearly feels such behaviour may facilitate his exit. And indeed, it would be no big surprise if other footballers in his position, such as Gareth Bale and Wayne Rooney, eventually opt to do likewise. After all, it is the next logical step, when the negotiating process hits a standstill – just another tactic in this chess-like battle between two similarly stubborn clubs. Yet, it would be unfair to castigate the Uruguayan international unduly for these remarks. Most footballers are prone to exaggeration, especially when just having signed a lucrative new contract. Indeed, he was probably contractually obliged to conceal the truth, given that Liverpool fans would surely not have been quite so supportive of their star striker had they known about the Champions League stipulation. What really hasn’t helped Suarez, however, has been the ostensibly disingenuous manner in which he initially tried to orchestrate his Liverpool exit. The star previously hinted the reason for his desire to leave the club was owing to the British media’s supposedly unfair treatment of him. Nonetheless, now that Arsenal appears to be his most likely destination, it is surely not a coincidence that Suarez has chosen to change tack, citing a need for Champions League football and the desire to win trophies as the primary reason for his disaffection. However, the most pertinent quote in last night’s interview came when he was questioned about his apparent ambition to move abroad. The bigger the company or football team, therefore, the more money Suarez gets paid. While he may not win many trophies at Arsenal, few neutral fans would doubt that it’s a level up from Liverpool, with the London club undoubtedly willing to offer him a more attractive pay package. Players rarely admit to moving to a club for the money, owing to the potentially disastrous consequences from a PR perspective, but it’s one of the defining characteristics of modern football. One need only look at Christopher Samba’s decision in 2012 to move from Anzhi to QPR or the abundance of world class footballers now moving to Monaco – another club who don’t currently offer European football – as evidence to support this point. It’s hard to imagine a footballer as notoriously unsentimental (and some would say, cynical) as Suarez thinking any differently. And why should he? Most people would act accordingly in his position. Of course, there is the argument that the club backed the player wholeheartedly during the infamous Patrice Evra race row, with some claiming that it meant the Uruguayan owed a considerable debt to the club. However, the Reds’ decision was surely borne largely out of self interest, rather than any sense of altruism, as they were naturally determined to preserve the reputation of their most indispensable player. Consequently, if the situation were reversed and Suarez was significantly under-performing, Liverpool would have little hesitation in letting him go, so why should the Anfield club expect their star man’s loyalty to be unconditional? Email “Opinion: Whether Liverpool fans like it or not, Suarez’s behaviour is symptomatic of modern football”. 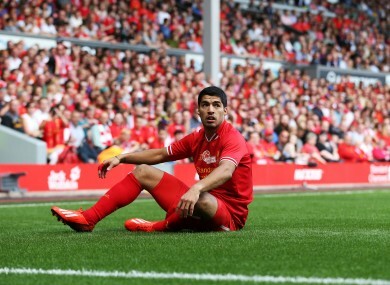 Feedback on “Opinion: Whether Liverpool fans like it or not, Suarez’s behaviour is symptomatic of modern football”.